The most trafficked piece I’ve written to date was on bad Spot Deliveries - when the dealer sells a car and then steals it back. Or threatens to, in an attempt to get more money. It’s the topic of this week’s podcast. But first, I have sad news from the control room of the Lehto’s Law studios. 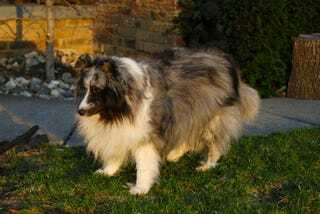 Milo, one of the two Shetland Sheepdogs who often wanders through the background of my videos, passed away on Monday. He was 14 and a 1/2 years old and was the Executive Producer of pretty much everything around here. That’s him in the top pic. Wolfy (left, below) will take over sole shepherding duties from this point forward. As for the topic of the show: car dealers sometimes sell a car to a buyer and then 1) tell the buyer they need to come back in and sign new documents (which replace the originals) with a higher interest rate or 2) retake possession of the car (i.e., steal it) and hold it hostage to force the buyer to cough up more money or to sign new documents. These transactions sometimes happen where the seller gives the car to the buyer and tells the buyer they have been approved for a loan when, in fact, there has been no loan approval. It is very fly-by-night and usually very illegal. Is it possible that these transactions MIGHT be legal? Possibly, but most often no. And if you are a used car seller and this topic pisses you off, go read the original article and complain there. You can join in with the other sellers who told me this was all the buyers’ fault. So, here is the audio of this week’s podcast. Dedicated to Milo (2001 - 2015). He had no last name. Like Bono or Sting. Just a heck of a lot cooler.